Hypatia, painted by Charles William Mitchell in 1885. Since that time, only fragments about Hypatia’s life have come down to us; allowing poets, novelists, playwrights, scientists, feminists and religionists (both pro and anti) to appropriate her story for themselves. Her story has resonated down through the years, touching many people. She’s a major character in my novel Selene of Alexandria, the subject of the recent movie Agora directed by Alejandro Amenabar, and she rated a plate in Judy Chicago’s massive art piece The Dinner Party. She’s the subject of plays, poetry, propaganda and new age pagan polemics. Her life is represented in art and music. But what do we really know about her? Not much. In researching my book, I waded through a literary swamp, with no guide, trying to get at some coherent view of Hypatia and her story. She was young/middle aged/older when she died. She was single/married/promiscuous/virginal. She was a pagan/witch/Christian. She was a brilliant mathematician/scientist to some and, according to others, contributed nothing worthwhile in either discipline. I read the few primary sources, but didn’t have the academic background to evaluate their usefulness. Socrates was a contemporary, but a church historian. Damascius was a pagan who wrote a full generation later. John of Nikiu wrote 200 years later. Who had an agenda and what was it? Two scholars have attempted to pull the pieces together in book form in the last two decades: Maria Dzielska, a Polish classics scholar, with Hypatia of Alexandria; and mathematics professor Michael A. B. Deakin with Hypatia of Alexandria: Mathematician and Martyr. I’ve read both, several times, in my research and want to share my thoughts. When I first got this book in 1995, it was a godsend. I finally had a book that cut through the literary myth and put Hypatia’s life in context. Dzielska divides her book into three main sections. The first deals with the literary legend of Hypatia; the second with Hypatia’s students; and the third covers her life and death. I felt she did a Herculean job of sorting through the myths and legends; and showing the political and artistic roots of some of the best known novels and plays. But it was in interpreting the primary sources, and critiquing their veracity and usefulness, that was most helpful to me. Dzielska carefully lays out her theses and backs them up. When she engages in speculation, she makes it clear. Among the most controversial of her proposals is that Hypatia was older than generally believed. Dzielska puts Hypatia’s birth year at about 355, making her 60 at death. Artists have a stake in her being a young beautiful martyr, but most scholars had put her age at death at about 45 (making her birth year around 370.) Dzielska argues that Hypatia would have been older than 20 or 22 when she was already teaching some of the land’s most elite young men. In the early 390’s Hypatia was a well-established philosopher and mathematician with many students from rich and powerful families. She might have been a math prodigy, but it’s unlikely she had the time to personally study the arcane nature of various philosophies and establish herself as one of the foremost philosophy teachers, much before her late twenties, at the earliest. Put another way, would a rich powerful man in the late 4C send his adult son to study with a twenty-year-old female? Possibly, but unlikely. It made sense to me that she was born before 370. How much before? No one knows. All scholars can do is present their theories and sources. As a novelist, it suited me to have her older in my narrative, so I went with Dzielska’s premise. For those who want to see Hypatia’s life in context, this is a great book. There are many myths about Hypatia. This book pulls back the curtain and lets us see (as clearly as possible with scant resources) the woman behind the legend, presented in lucid prose. In doing my original research, I ran across Professor Deakin and his most useful website where he posted all the primary sources that mentioned Hypatia. Over the years, he spoke of her at conferences and wrote articles. Finally, in 2007 he published his book and I got to add another resource to my research shelf. Deakin’s work differs from Dzielska’s primarily in style and a little in content. Mathematician and Martyr, seems drier and more academic than Dzielska’s work, but is still very readable to the non-academic. Deakin lays out his book like a syllabus with discrete chapters and sub-chapters. 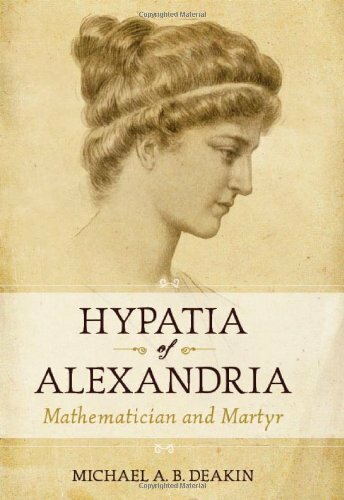 He briefly covers the history of Alexandria, mathematics, philosophy and religious development, and the political scene during Hypatia’s life. He evaluates the sources, her death and her mathematics. In almost all ways, his interpretation of the sources varies little from Dzielska’s, including the earlier birth date. But he adds one important piece: Hypatia’s contributions to mathematics. Deakin does a great job of looking at the sources and piecing together the clues to Hypatia’s work. Even a non-mathematician can follow his arguments and have a clear understanding of what she did or didn’t accomplish. He very considerately puts the more arcane mathematical discussions in his appendices, letting us choose how much we want to delve into the minutia of the Greek alphabet, and its relationship to numbers and long division. None of Hypatia’s writings on philosophy survive, but there are some slim clues to her mathematics and Deakin pulls them together for us. In summary, I liked both books. Taken together, they give a fuller picture than either alone. Dzielska adds the literary tradition and Deakin the mathematical. For anyone wanting the whole picture of Hypatia, Lady Philosopher of Alexandria, I’d recommend reading both. I found Hypatia fascinating as a character while reading Selene. Thanks for recommending further reading. That’s an interesting painting. I didn’t really picture Hypatia as a blond. Neither did I! But she was Greek and possibly Macedonian, so…who knows? I enjoyed hearing about your research process. It’s such a joy when you come across a really well done book that cuts through the confusion. I sympathize with trying to sort out conflicting primary sources and legendary traditions. I face that also with my own writing set in Bronze Age Anatolia and the Homeric tradition. At least I have some primary sources. It must be much more difficult dealing with the Bronze Age! Thanks for your thoughts on these two books. I’ve read Dzielska’s, and look forward to Deakin’s to flesh out the legend a bit more. Nicely written, and I am certain Hypatia herself would have been pleased with your piece. Looking forward to reading your novel. 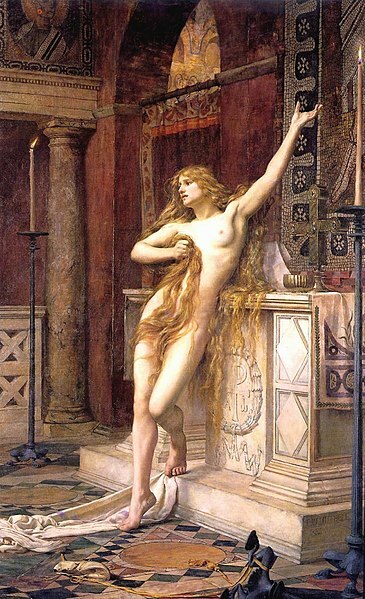 One point I would pose on the age of Hypatia when she was murdered…. Longevity in those days was more abbreviated than nowadays, wasn’t it? A sixty-year-old would have been considered pretty elderly, wouldn’t she? There are two different ages for Hypatia at her death. One is in her sixties, but the other puts her at 45. Given the story about her and her father Theon witnessing the arrival of the Roman Prefect who announced that beginning of state-imposed Christianity as decreed by Emperor Theodosius, it would seem like the later birth date of 370, or close to it is more likely. We have to be careful about attributing our standards of age on antiquity. Alexander the Great had conquered most of the known world and died before most of us would have received a graduate degree. As for her significance, how can anyone doubt that when John of Nikiu found it necessary to justify her murder 200 years after the fact, it signified her importance as a historical figure. Why? John calls her an idolator. So I think it’s pretty clear that the church did not regard her as a Christian. And while some may call her a witch, they said that about a lot of talented women. Besides, Biblical law would have dictated that she be stoned to death rather than flailed. As to her marital/sexual status, it is pretty clear that she could not have been married under Roman law and have acted as independently as she did. She controlled her wealth, an impossibility under Roman law for a married woman. She was the last known librarian of the Alexandrian library. Neither of these things, much less teaching would have been permitted to a married woman. Indeed, one of the things we can extrapolate from the absence of her first-hand work is that the Church endeavored mightily to wipe her name and accomplishments from history. I think we ought to take that as a testament to her. I’m in a better situation that I read the original, not a translation. Generally speaking Dzielska’ book is very uneven. Although the second part of the disciples of Hypatia and Neoplatonism) is scientifically OK – browsing the source etc – much part of the first, opening part, is more than tragic. First of all, this type of discussion (“references in later literature”) should be affixed to the end, not at the start of work. Dzielska burned at the beginning of the whole work, describes these cultural influences in a very subjective, emotional and personal tone. Christocentric bias is more than evident. She alleged passionate and personal opinions Voltaire, Gibbon and others, however she does the same thing and say in no less personal in tone. If she does not agree with the opinions of some quoted authors she intervenes in the original text, inserting into it the various question marks and exclamation points in parentheses!! !This action is unworthy of a scientist. This completely discredits the scientific workshop and greatly reduce the value of Dzielska’s work. After this lamentable introduction, even quite well-written part two of the book fades significantly. I love all of this Hypatia research. Excellent job! i’ve been bitten by the Hypatia bug…! above you offer to supply anyone interested but suffering from fiscal shortage with free pdf copies. i’d fall into this category, unfortunately [honest]. there doesn’t appear to be another way of contacting you, hence i post my request as a comment. 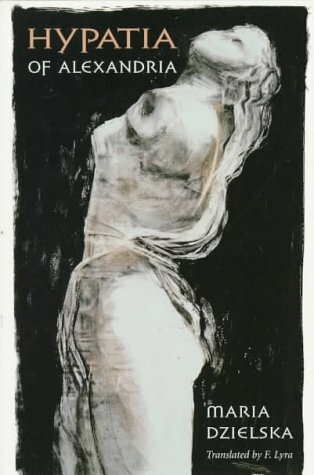 i think i can acquire Deakin’s work, but i’m burning for Maria Dzielska’s and yours. i’d be so grateful if you could contact me. Thanks for reading and commenting. I’ll send my Hypatia book out ASAP. If you like it, I hope you take the time to write an honest review and post it to Amazon and/or your other favorite online book stores/reading sites. And yes, I will. Actually also to some other bookworm sites, if that’s welcome. Hey you, I loved your idea of formulating the ebook and as I’m a graduate student student who can’t buy it, I would like to ask if you could send me a free copy tto have a look. Please contact me at laurabgaraujo@gmail.com Thanks! 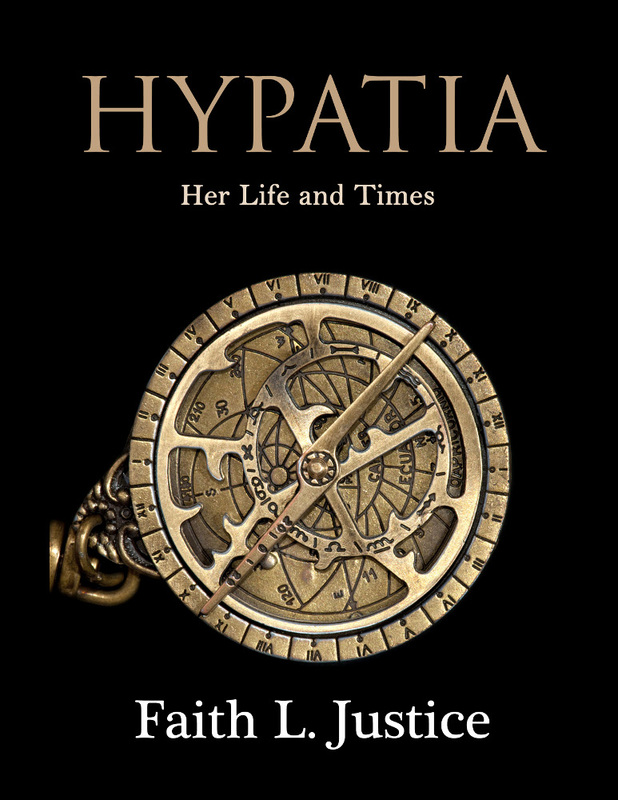 Hey, could you please send me a pdf of “Hypatia: Her Life and Times”? I am a university student, I study history, and I have a project to do on Hypatia, so you would really help me. My name is Hypatia. I am an 8th grade middle school pupil about to write a research project about my namesake, and would greatly appreciate a copy of your pdf. Thank you in advance. Hypatia.